I've added another horse to my walls. It's just taken a long time for him to get there since this project has been cooking along in the back of my head for several years while other projects took priority. 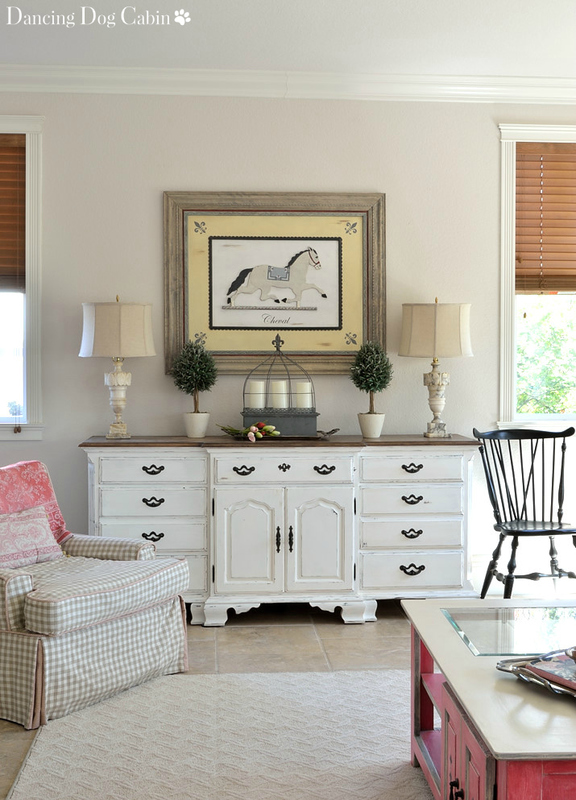 I was initially inspired to embark on a project like this by all the architectural-salvage-as-art and vintage signs that you see everywhere, as well as by frequent visits to Lowe's when we were adding crown moulding and baseboards to the house. After spending countless hours standing in the moulding aisle and staring at the wide selection of crown mouldings, window casings, chair railings, etc. it dawned on me that I could create my own architectural-salvage style wall art. I just needed a piece of art or a graphic for the focal point. 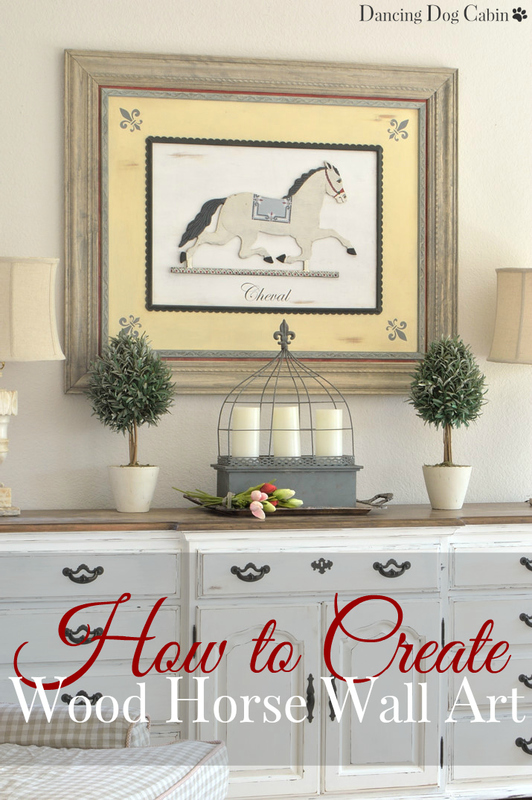 A couple of crown mouldings and chair railings + a piece of plywood + the horse + some paint= highly personalized and unique wall art. At a fraction of what you would pay in a store or online (have you seen this wonderful vintage style blacksmith sign by Ethan Allen? When it was still available, it sold for $262. This was also another source of inspiration for me). So, with all that...here is how I brought to life the child of my latest brainwave. Also, we used a table saw (you can also use a hand saw) to cut the the moulding pieces. I say 'we', because, fortunately for me, my wonderful husband helped out with this step, including cutting the crown moulding for the outer frame, which is tricky because it is not a flat piece. I'm sure this guy decorated some little boy's western-themed bedroom in his previous life, but I wanted something more Frenchified (but on the rustic side of French, nothing too fine and fancy). I also wanted something reminiscent of the circus, but in a vintage way. 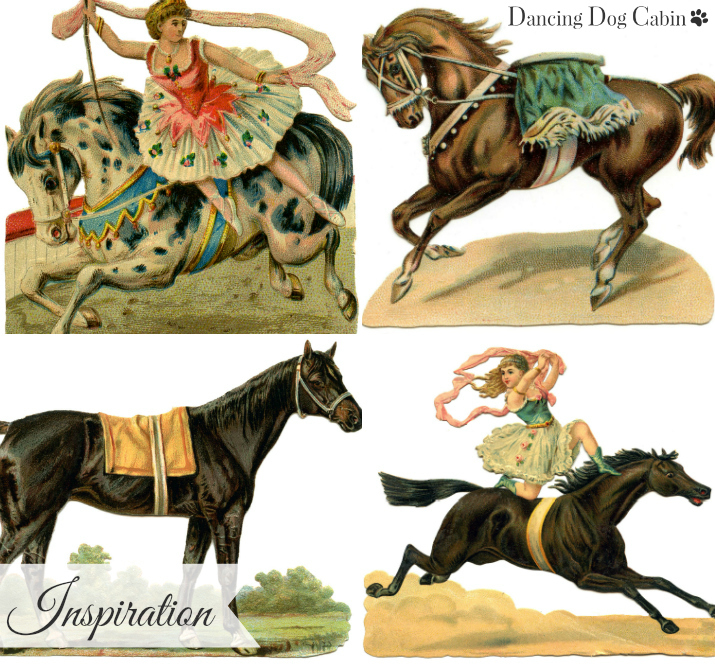 I used these clip art images from The Graphics Fairy as my inspiration for transforming the horse from Old West to Fanciful Circus. I used both chalk paint for the overall color and acrylic paint for the saddle, bridle, and the strip of wood below the horse. 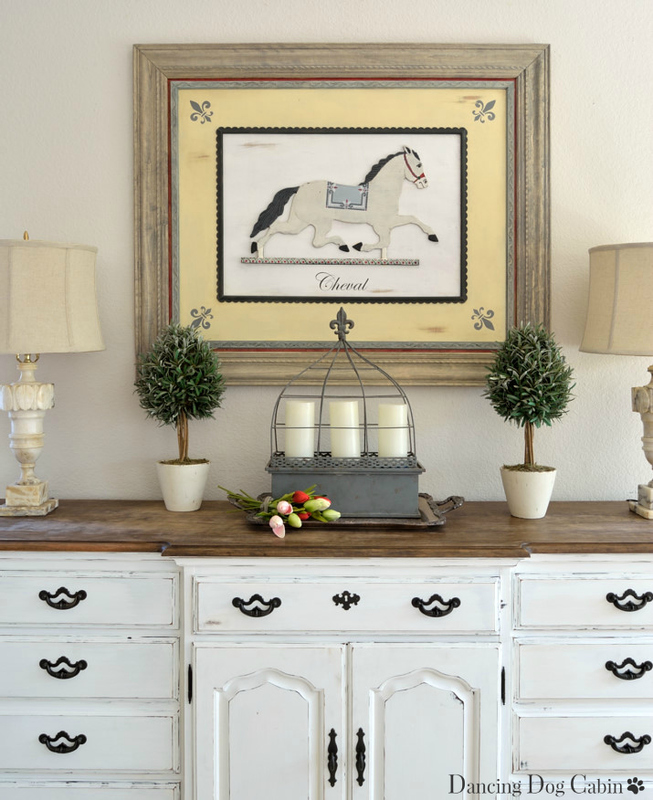 Because I want to incorporate more touches of black throughout the living room (hasn't happened yet), I used touches of soft black (Graphite chalk paint) throughout this piece, starting with the mane and tail on the horse. Pure White mixed with a touch of Paris Gray for the body; Paris Gray for the saddle. I used a stencil to add some simple decoration to the saddle. 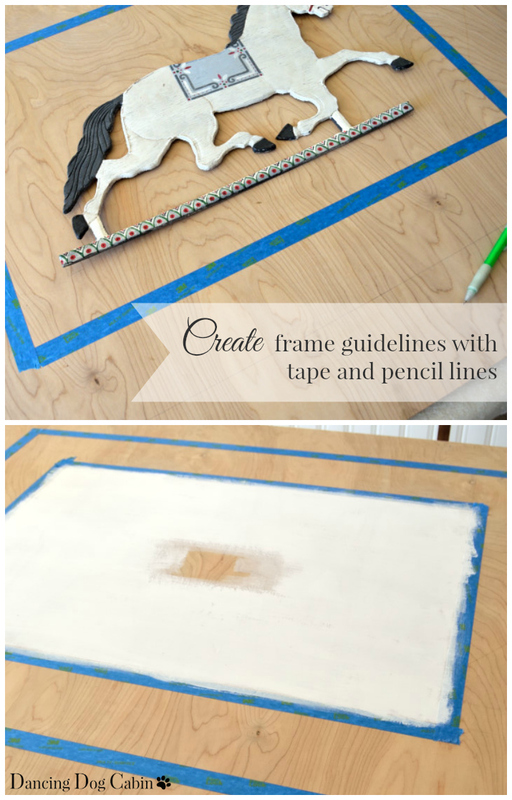 I marked the location of each frame on the plywood base using a pencil and painters tape. I painted the plywood with Cream (really, more of an ivory yellow) chalk paint, Pure White chalk paint, and a thin strip of Emperor's Silk chalk paint on the outer edge, and added some additional fleur-de-lis details in the outer corners (acrylic paint). 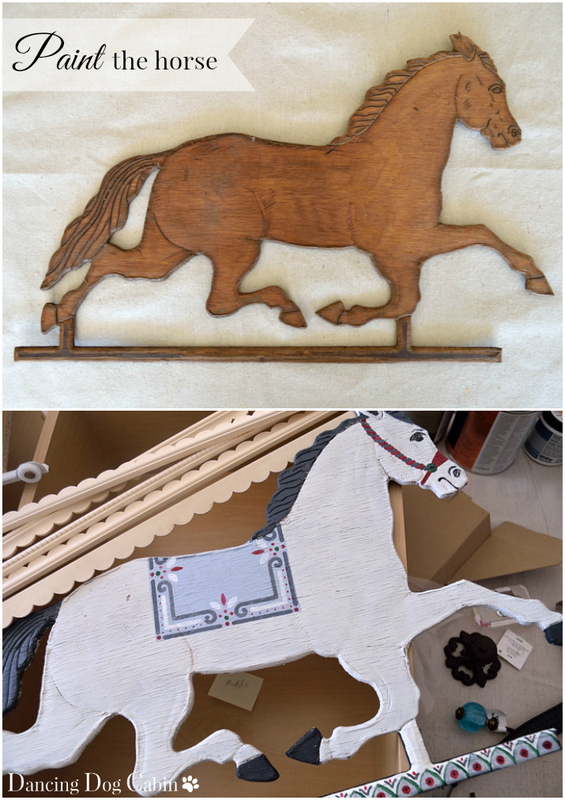 I completed all the painting and detailing (including the word transfer, see below) on the plywood before gluing down the frames (and the horse) so that I didn't have to work around the glued pieces. Also lightly distressed the painted plywood with a fine grit sandpaper to give it an aged, worn appearance. 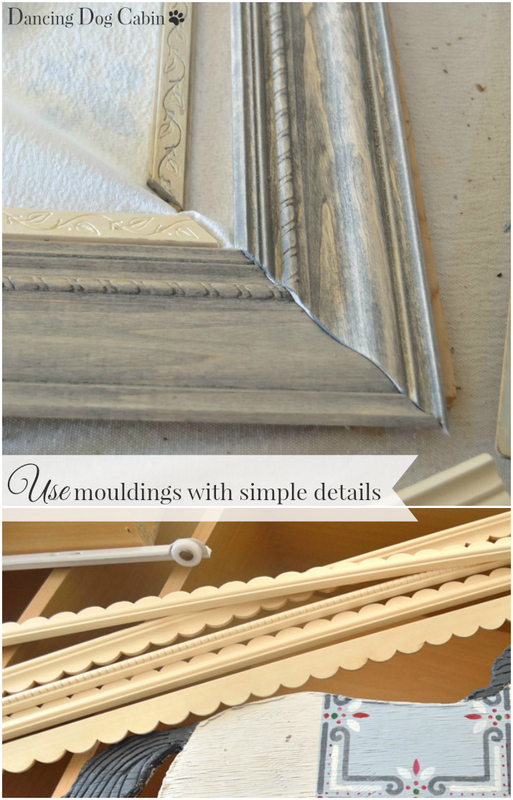 I chose three moulding pieces in varying widths to create a series of frames, including a small crown moulding for the outside frame. I used pieces with fairly simple decorative details-- I didn't want anything too lavish or overpowering-- remember, 'Rustic French'. Cutting the end of each piece at a 45 degree angle (as I note above, my husband took care of this step). Staining and painting the mouldings of each frame: Classic Gray stain for the outer/crown moulding frame, Duck Egg chalk paint for the next floral frame, and Graphite chalk paint for the inner scalloped frame. Gluing the 4 pieces of each moulding type together at the corners to create the final three frames. For the stain on the outer crown moulding frame, I wiped it on and let it sit for only a few minutes before wiping it off, since I did not want a dark stain. I piled a lot of big, heavy books on top of each frame once they were glued in place to ensure full contact between the frame and the plywood sheet and to prevent any warping. 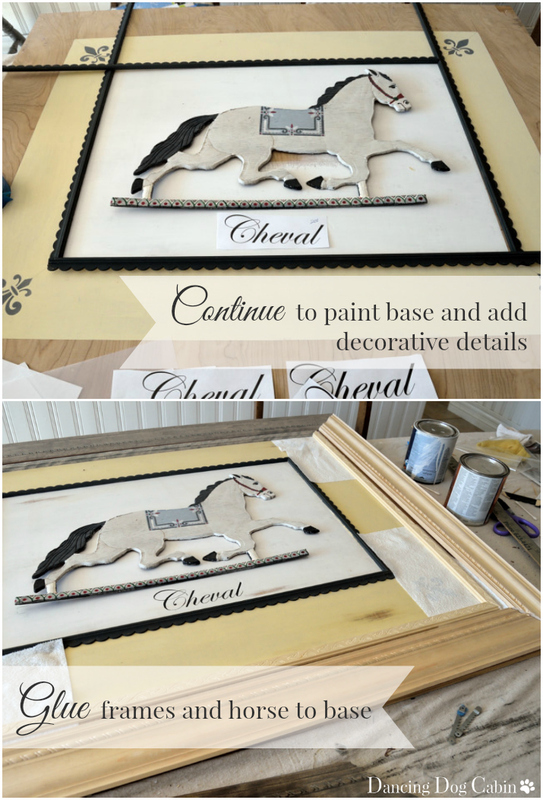 To reinforce the Frenchiness of the whole thing, I added the word 'cheval' under the horse using the wax paper transfer process explained here. This also added to this piece the graphic element that I really love in old, vintage and reproduction signs. 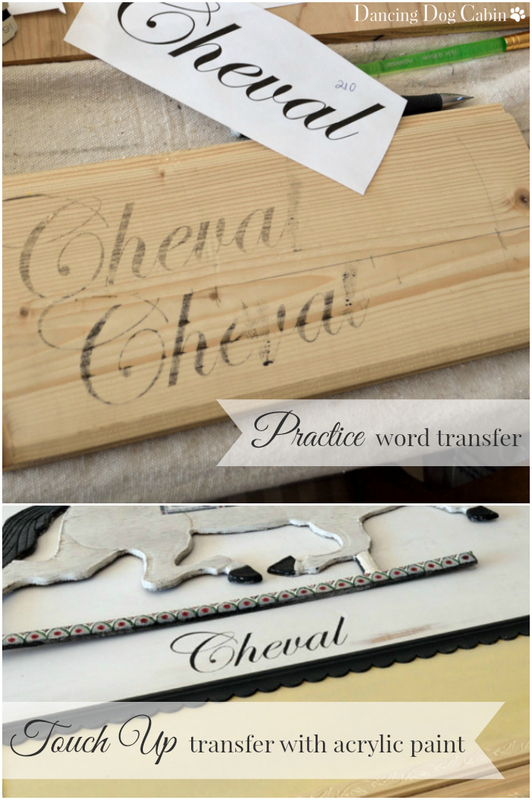 I practiced the actual transfer process several times using scrap wood, and once I transferred the word to my piece, I had to darken it using black acrylic paint and a fine paint brush. As you can see from the practice pieces below, the end result of the transfer process is pretty light and faded (I felt like the final image on my piece needed to be darker and bolder). Note for the practice pieces below: I experimented on my computer with different values of gray and black font colors. A lighter gray font color yielded the very light, faded image seen below, while 100% black resulted in the darker image, which was still pretty faded and distressed looking. The last step was, of course, to hang it on the wall. Once again my very handy husband helped me out (this thing is really heavy). We used two d-ring style hangers on the back and drywall fasteners to hang it securely on the wall. 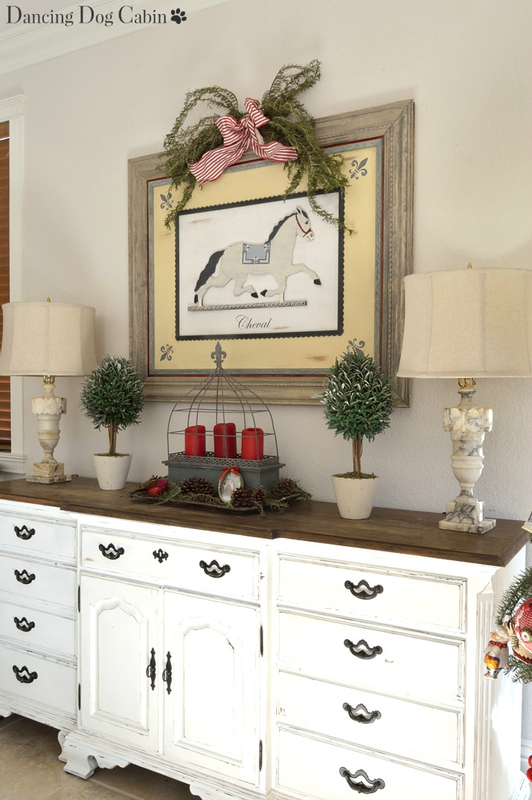 This project was really a companion project to the dresser transformation; I really wanted a strong focal point at the far end of the living room, and the large, dimensional presence of this horse wall art piece combined with the oversized dresser/console achieves that. I keep throwing around the word 'French' in this post, in part, because when I think of architectural salvage I often think of trumeaus. Trumeau has two definitions: (1) a column supporting a tympanum of a doorway at its center, or (2) a mirror having a painted or carved panel above or below the glass in the same frame (and usually a lot of other carved and ornate frivolity in some of the more elaborate pieces). Essentially, both both are architectural and decorative elements that originated in France; one supports doorways and arches, the other decorates walls. Obviously the piece I created here is more in line with the second definition (very loosely, I know). So, is it a trumeau, a sign, a picture? A little of the last two, I would say, with a slight nod to the carved detail of a trumeau thrown in for good measure. 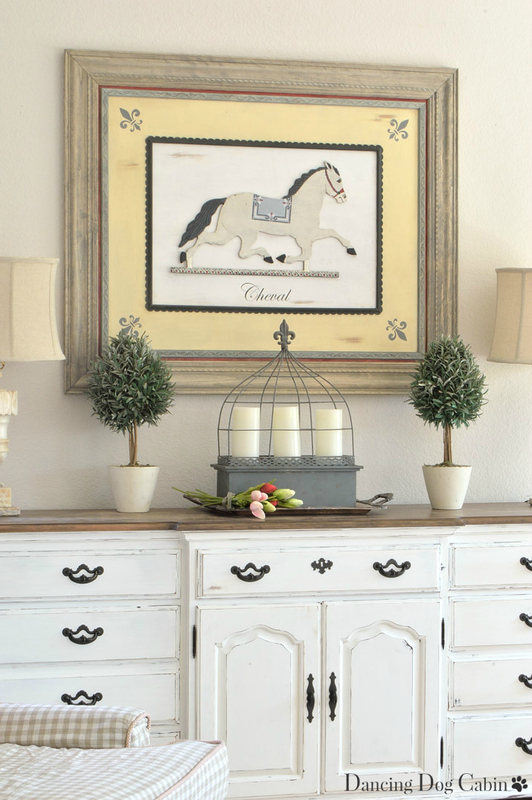 The horse plaque was a great antique store find and your transformation of it was fantastic. It looks beautiful hanging above your buffet. Thanks for sharing such a fun project. Thank you! 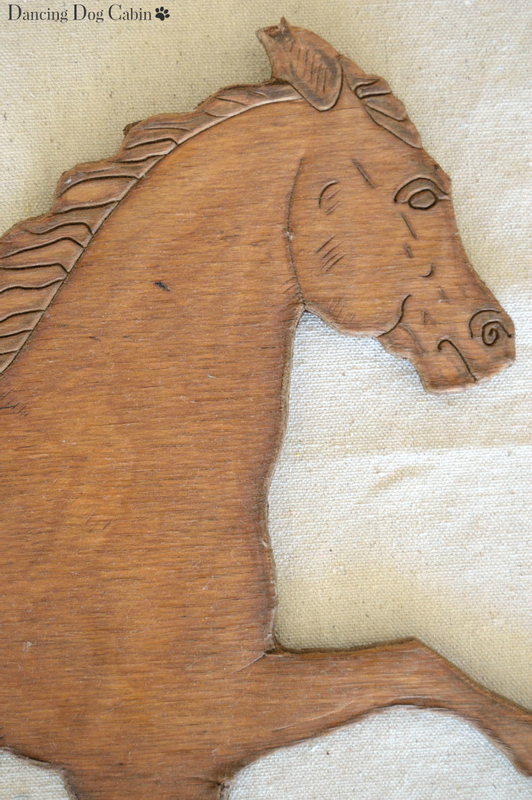 Yes, I got lucky when I found the horse because it was perfect for this project. I enjoyed this project. I like the layers and the texture. Pinned. You did an amazing job...I love it!!! You did an amazing job. I love it! Thanks for sharing with SYC. Such a wonderful tutorial and beautiful space, Melissa! Thanks for sharing @Vintage Charm! What a beautiful wall art, love all the layers and texture it has. Beautiful work. I love the difference when you changed the colour of the candles etc. The white ones really lighten the whole wall area. Both are great. Thank you Helen! The photo with the red candles was from Christmas. I like it better with the white candles too, however. Thank you Rue! I know what you mean about the fingers. I'm pretty accident prone, so I leave the power tools to my husband. I'm doing well and I hope you are too. 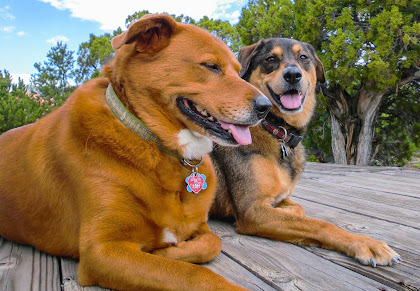 Hi Rue, I’m hoping to post soon...Life is interfering with blogging at the moment. Thank for the very detailed instructions, Melissa! I've noticed you highlighting you used a table saw? My husband only has this portable kind of wood cutter and I'm thinking maybe I could ask him to do the moulding pieces. You mentioned a hand saw can be use, so I'm pretty confident about this.